NCIL Thanks Our Members for Making the 2013 Congressional Briefing & Reception a Bipartisan Success! You are here: Home / Independent Living & The Rehabilitation Act / NCIL Thanks Our Members for Making the 2013 Congressional Briefing & Reception a Bipartisan Success! 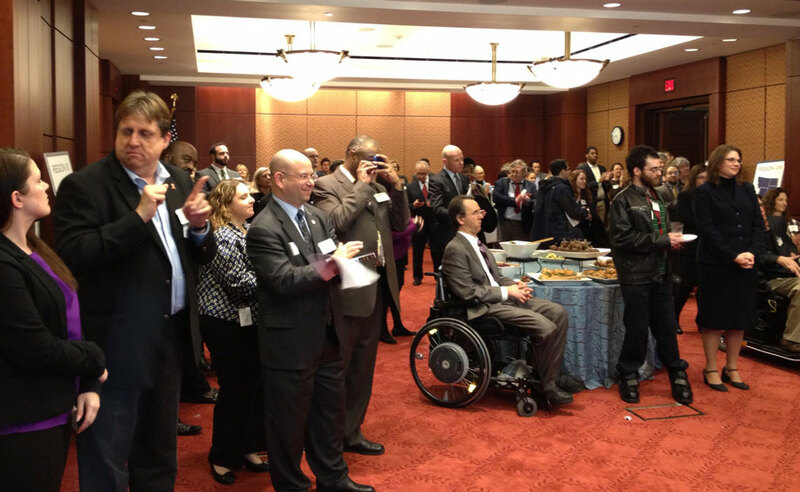 NCIL would like to sincerely thank our members for making the 2013 NCIL Congressional Briefing & Reception a success. It was clear that our advocates did their part by urging their congressional offices to attend even amid packed schedules, budget cuts, and sequestration. There were also a number of individuals representing the Administration, including the Department of State, the Department of Justice, the National Council on Disability, the Office of Disability Employment Policy at the Department of Labor, the Administration for Community Living, the Department of Health and Human Services, and the Department of Education. The keynote speaker of the night was one of NCIL’s most loyal friends, Senator Tom Harkin. This will be Senator Harkin’s last term in Congress, and he encouraged our members to work closely with him over the next two years to achieve as much progress as we can together. NCIL would like to give a special thank you to Amerigroup for sponsoring this event, particularly Merrill Friedman for generously supporting this event for the past few years. The NCIL 2013 Congressional Briefing & Reception could not have happened without their support. NCIL’s 2013 Annual Conference on Independent Living will be held on July 24-27, 2013 at the Grand Hyatt, Washington, DC. Your members of Congress will have another opportunity to show their support for Independent Living, and we hope that you will be there to see them in person! Thank you for your help to make the 2013 Briefing a success, and we look forward to seeing you in July!